The Department of Computer Science has started its work in 1972, at that time one of the first departments of this kind. Since then we have always been one of the largest computer science departments in Germany. Today, more than 2 000 Students are enrolled in our courses. We are very pleased that approx. 15 % of our students from 49 different foreign countries have chosen our department to study computer science. With 22 professors and a research and teaching staff of about 160 employees we are able to cover a broad spectrum of scientific fields. Furthermore, the departmental structure of the Technical University Dortmund offers in many ways a nurturing environment: with engineering and technical departments at its center, we can pick up challenging problems from numerous fields, and, hence, constantly sharpen our profile. Today, our department cultivates collaborations with numerous institutions in and outside our university. to contribute to computer science as a key science of our times with forward-looking research and development. We are glad to take part in an highly international exchange of ideas and research results. 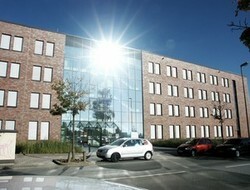 Consequentially, we encourage students from all over the world to study computer science in Dortmund.